Director Edgar Wright and actors Simon Pegg and Nick Frost reunite for the final instalment in Edgar Wright’s ‘Cornetto Series’, past movies were “Shaun of the Dead” (2004) and “Hot Fuzz” (2007). 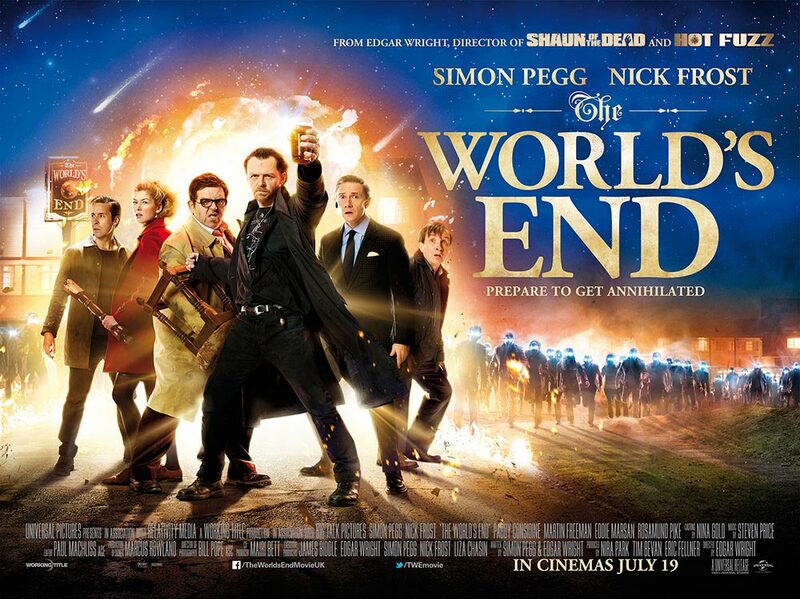 They are all back together for the apocalyptic pub crawl movie, “The World’s End”. In “The World’s End,” 20 years after attempting an epic pub crawl along the Golden Mile, Gary King (Simon Pegg); a 40-year-old man trapped at the cigarette end of his teens, reunites five childhood friends (Eddie Marsan, Paddy Considine, Nick Frost and Martin Freeman) as he becomes hellbent on trying the drinking marathon again, dragging his reluctant pals to their hometown and once again attempts to reach the fabled pub – The World’s End. All of the friends apart from Gary King have moved on with their lives and have become very successful and all act appropriately. As they attempt to reconcile the past and present, they realise the real struggle is for the future, not just theirs but humankind’s. Reaching The World’s End is the least of their worries. It is a character switch for Pegg and Frost; in the past two movies (“Shaun of the Dead” and “Hot Fuzz”) Pegg has played the mature character, the reliable and together person. Frost on the other hand has played the crazy unreliable friend who doesn’t have it together. Pegg playing Gary King in this movie is a great change, he plays this type of character, it gives him a chance to do something different and he does it so well, it also gives the audience the opportunity to see a great actor. The whole cast have such a natural chemistry together it makes for a very smooth movie, with fun dialogue and perfect one liners. There are moments of sheer class and moments of riotous laughter from the whole audience. The best source of comedy from this movie comes from when the group of friends are trying to grasp what is going on in the quiet village of Newton Haven. Another hit for Wright, Pegg and Frost. Celebrating British humour and our unique way of doing things, a satisfying ending, definitely saved the best till last.